Good news for all you Wii U owners who have spent months groaning about the console's sluggish speeds – Nintendo has heard your cries of anguish. The console will be getting two updates in April to cut the waiting time when returning to the home screen, meaning switching between games and apps will be a whole lot faster. Nintendo posted a YouTube video on its channel to show just how much faster that will be - the side-by-side comparison of the console before and after the update shows that exiting a game will take around eight seconds, while it currently takes an excruciating twenty. Software boot-ups could also be a lot faster on the Wii U, but there's no mention yet about this being included in the upgrade. It's quite possible that it will be part of the overhaul though, so hold tight. Nonetheless, this is all good stuff. 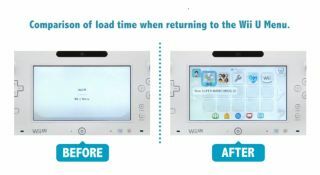 The sluggish interface was something we flagged in Nintendo Wii U review, so it's nice to see Nintendo finally doing something about it. Looks like it's taking its place in the console race a bit more seriously. And while we've got you, Nintendo, a few more games would be nice too, yeah?